CladdaghRings.com began life in a small premises under the shadow of the Guinness Brewery in the heart of the Dublin Liberties way back in 1998. 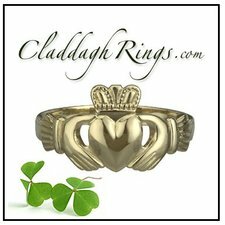 Since then, and thousands of satisfied customers later, we have become the home of the Claddagh ring on the Internet. We are dedicated to providing only the highest quality Claddagh jewelry. All our jewelry is handmade in Dublin by skilled craftsmen. http://MuseumWayPearls.com is an online only retailer of fine pearl jewelry. Our pearls are sourced direct from pearl farms and as a result we are able to keep our prices low at 80% off retail. We offer a diverse selection of bridal jewelry in freshwater and akoya pearl categories and have a great selection for the bridal party as well. Museum Way Pearls offers free shipping and a free appraisal with every order. \\\\\\\"Minter + Richter Designs handcrafts custom titanium wedding rings and bands, with a variety of inlay materials, from the well-known (wood, stone) to the exotic (antler, meteorite) to the truly personal (sand from the beach where you met). Because each love is unique, Minter + Richter offers the first-of-its-kind Love In Your Ring Wizard an online app that allows you to put your personal style into your ring. All our rings are handcrafted in Boston MA and come with lifetime care options to keep your rings protected and looking beautiful. Put the love in your ring and ring in your love at http://www.MinterandRichterDesigns.com. \\\\\\\"
Lia Sophia is beautiful designer inspired jewelry featured at an affordable price for everyone. Look like a Celebrity on your big day with out paying the price! Please visit my web site to learn more about our customer save plan and current specials & extra specials for Brides! I look forward to helping you save money and putting it towards something great for your big day! !